Coca-Cola says Rio 2016 sustainability efforts to be "bigger and better"
Coca-Cola has told C&IT's Agency Forum attendees that it is planning to up its sustainability efforts for Rio 2016 after pioneering the IS0 20121 standard. Coca-Cola's sustainable Games project co-ordinator Olivia Knight-Adams told delegates that she is currently working on guidelines to help the Rio 2016 sustainabilty and events teams build on its London 2012 strategy. "Making a bigger effort is always the goal so we're hoping to do even more for Rio 2016. For London 2012 we were lucky to have support from everyone in the top levels of the company, who knew that we had to allocate the required resources to make London a success," she said. Knight-Adams went on to outline how Coca-Cola set about organising its ambitious sustainability project, assigning "sustainability champions" in its various brands and internal departments. "We made sure that not only senior level staff were involved, but also more junior staff who were enthusiastic about the cause. Instead of assigning a list of targets for the departments we asked them to come up with their own to really get them involved in the thinking," she added. Coca-Cola's sustainability efforts, outlined by Knight-Adams in her presentation, included a scheme to decrease its carbon footprint by 15% by 2020 and a pledge to recycle more than it produces. Elsewhere, various youth projects were supported as part of Coca-Cola's legacy plans, including a scheme to involve theatrical students and artists from institutions, including the Royal College of Art, in creative projects for the Games. "Around the stadium, we employed a group of performers to applaud anyone who was recycling bottles and using our dedicated recycling bins. It helped add a bit of fun to what isn't the most exciting part of anyone's day," she added. 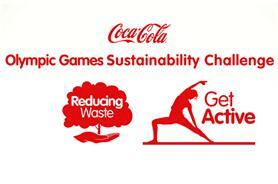 Meanwhile, a Street Games project to get young people involved in sport was supported by Coca-Cola. "The project encourage young people often from deprived backgrounds to get involved in sport, tackling challenges often overlooked by other organisations," she said. Knight-Adams went on to discuss the influence of organisations including Defra and WWF, both of which were instrumental in helping the company outline its sustainability objectives. Read more from Coca-Cola's Olivia Knight-Adams here. Coca-Cola says its tickets usage is "very, very high"